Hi guys looking for some information about what it takes to take the vr6 engine out a mk3 golf and drop it into the 6n estate, not much coming up on the web besides a really old thread on here just showing it finished. i know the two cars run the same chassis so subframe wise it should bolt in, but i cannot think of any serious problems with swapping the engines. so can some one correct me or should it be straight front as swap the ecu and loom then swap and bolt all the engine bits across including driveshafts, only think i think may be an issue is the drive shaft spline on a vr6 would be different to the polo. if any one can shed some light onto this as im looking into buying a clean estate. I bought a 9n polo in march that needed a new engine (AWY) so I did that and now the replacment engine(Also AWY) has just blew its head after its 3rd rebuild and so I would rather have some fun with fitting something bigger like a jet engine or a saturn 5 rocket but as they don't fit standard 02T gearbox I was thinking 1.6 8v or 20 8v from 1J golf. Am so far cost of car and engine and everything else am like £500 in the hole so rather than quit and buy something else I would rather stick something fun in it for long term as a daily runner. Hi all haven't posted in a while My polo has been off the road for a while now and I've had big plans but haven't been in a position to carry them out. I have settled on a 1.8t conversion mk4 golf. I'm looking for some help and advice on ideas and tips for the best way about it. Does anyone know which way to put the power down would be ie golf suspension And hubs or polo suspension . I want to add the braking system if that's possible I also want to add power steering either from the golf or someone told me there's a corsa set up which works. I will be making a build thread to go with it and any help ful information wil be appreciated. Does a MK2 golf carpet fit in a MK2 breadvan? my carpet is tatty and blue in my Breadvan and I want a black one but it is a nightmare to find a carpet for the breadvan, i have found a MK2 Golf carpet. will it fit? thanks. Hi! I own Polo 6n with 1.9d engine (AEF), and it is dying. I have Golf mk2 with great engine (1.6td, I think engine code is MF). My idea is to put golf engine in my polo but I do not know is it possible because AEF leans to front and has completly different engine mounts position... I have been speaking with a guy that says that polo mountings can be installed to golf engine, that there are holes, just little smaller. Any help would be appreciated . P.S. I am student in Croatia, so I would try to keep costs as low as posible. Hi guys a while back I remember seeing someone's custom tweeter install using the original speaker grills in a mk2f or it might have been a golf. I can't remember weather it was a guide or just a pic but if someone could point me in the right direction I would be very thankful. So I got one of these spi Golf air intakes to put a cone filter (for aesthetic purposes) but have an issue... Space. Also I've got a new webber but the air intake won't fit it only the peterburg. Any advice? Will upload a pic. Yoooo! Just wanted people opinions/thoughts on my next car... used to have a 6n, 1.4 8v which i loved till the gearbox went Currently i have a MK5 Golf tdi but that is soon to be my girlfriends. i have a budget of about £1500 to spend on a car and was wonder what people thought of the following and which you'd personally go for... EDIT - Only have eyes for a 3 door too, not that I'm picky.... If i could find one with decent milage, i'd love a 6n again. but preferably the 1.4 16v Open air... Mk2 Golf 1.6 driver or GTi... Mk2f/Mk3 Polo Coupe 1.3... MK3 Golf 2.0 GTi... BMW E30 (any 2 door saloon, preferably hard top) Or finally a MK1 Mx5 1.6 What does everyone think? All are roughly the same to insure. Any Good/bad points about the cars would be helpful too and any helpful comments welcome! Cheers, Jamie. So I thought it was about time that I made myself a thread. A little about myself, I'm David, 23 and I own a mk2 Golf Ryder. Got it a little over a month ago from a scrapyard believe it or not. One previous owner, 127,000 miles. Body work is great other than some minor rust on the arches and a single dent on the rear quarter. So far I've change the indicators and side repeaters for smoked ones. Got some cheeky Hella rear lights too. Also given the whole thing a much needed t-cut and painted the bumpers and splitter back to a nice dark black. The interior just as clean as the outside. Apparently the previous owner had no wife or kid's, so it's not been abused . Looks live i dont have any pictures that are up to date. Ill get a few soon. 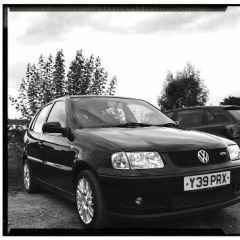 Thats my mates MK3 Polo GT in the last pic. Current plans for the car? New speakers Lows Handling mods New exhaust Maybe a paint job, depending on the quote.